I received free pistachio samples from the Pistachio Health Institute mentioned in this post. By posting this pairing I am entering a contest sponsored by Pistachio Health Institute and am eligible to win prizes associated with the contest. I was not compensated for my time. 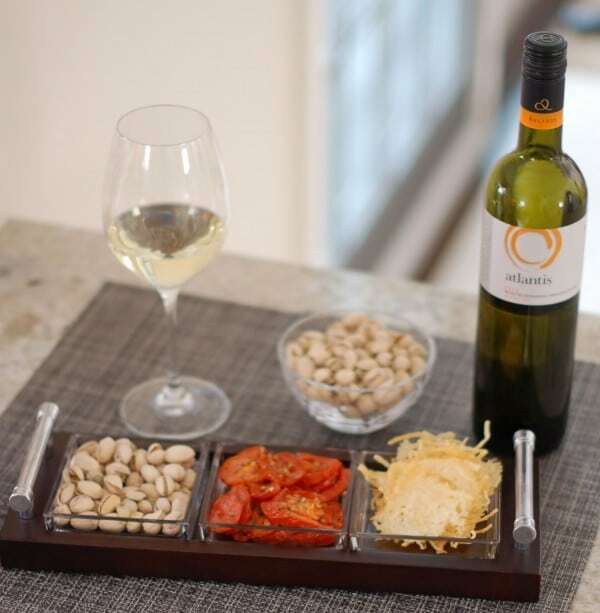 In-Shell Pistachios + Rosemary Garlic Roasted Tomatoes + Parmesan Crisps + Assyrtiko Greek Wine = mmmmmmmm!! A one-ounce serving of in-shell pistachios equals approximately 49 nuts, which is more nuts per serving than any other snack nut. And a reduced serving of 30 pistachios is just about 100 calories – talk about bang for your buck! Pistachios are also a good source of phosphorus, thiamin, copper, magnesium, and vitamin B6. Pistachios are filled with the heart-healthy monounsaturated fats and protein, two nutrients that help keep you satiated and your blood sugar levels stable. 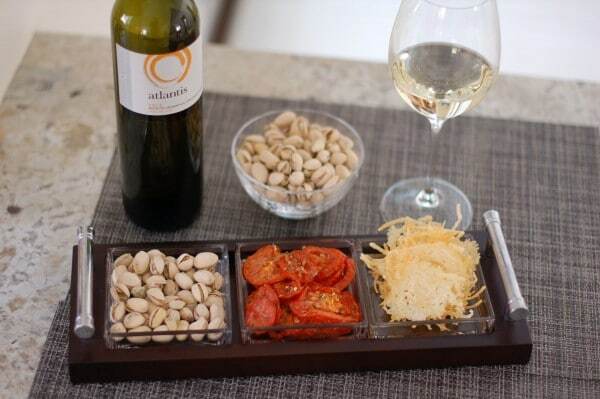 We eat with our eyes as much as our mouths, especially when it comes to in-shell pistachios! A recent study in the journal Appetite found that study participants who left pistachio shells on their desk while snacking reduced their calorie consumption by 18 percent compared to those who discarded the shells. 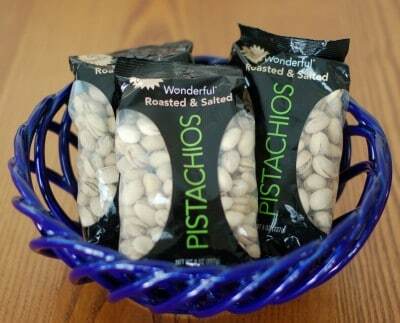 They also took in fewer calories than those who consumed pistachios without shells. The visual cue of seeing empty shells reminded people how much they ate and encouraged them to reduce their calorie consumption. Another calorie-saving benefit of in-shell pistachios: the time it takes you to shell these nuts will slow you down and help you register your hunger and fullness cues. While in-shell pistachios are great for snacking on alone, you can also cook with them, or in the spirit of this contest, pair them with different savory or sweet foods. Each item in my pairing can be consumed by itself, or you can build an all-in-one snack – what I call the Parmesan Tomato Pistachio Tower. Crack ‘em, Chew ‘em, Love ‘em! Thanks Serena! Isn’t Santorini the best?! I wish I was back there right now!! Oh yum – love those parmesan cheese crisps – need to make them again! great idea with the parmesan crisps!! Thanks Lindsay and Deanna. It was my first time making the parmesan crisps- don’t know why i never made them before!! My husband described the tower as the perfect combination of chewy, juicy, and crunchy textures and salty and sweet flavors! 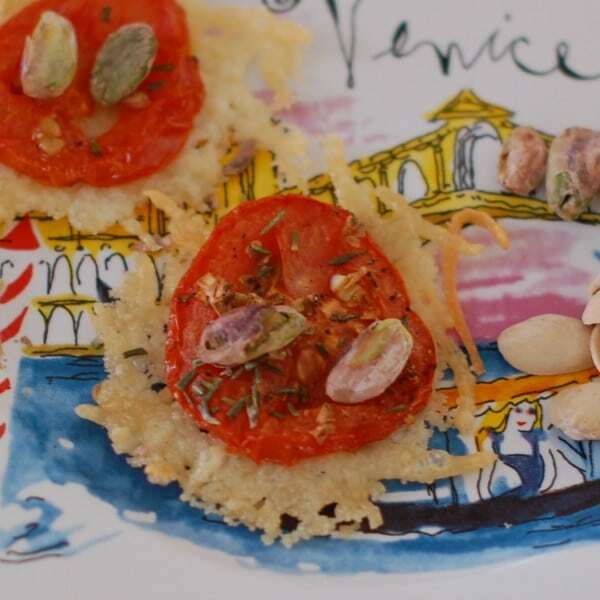 I love roasted tomatoes, but haven’t tried to make parmesan crisps yet – this will be happening soon! Thanks! It was my first time making the crisps and it was so easy! Good luck! We need to make these home-baked parmesan crisp — love the idea! Thanks McKenzie! They were actually so simple I was wondering why I never made them before!